padma media and marketing creates strategic marketing and communications initiatives that target ethnic consumers, including bilingual and bicultural Hispanics and South Asians. How did you come up with the idea for your business, and what were your influences and sources of motivation? Ana Lydia Ochoa: I have been a PR practitioner for more than 12 years and have never questioned my career choice. My career began by reaching out to general consumer markets which eventually led me to creating communications initiatives for various Fortune 500 clients that reached Hispanic consumers. This, of course, was before Ricky Martins explosive Grammy’s presentation! From that moment on, Hispanic consumers were no longer an afterthought – we were seen as a burgeoning and important consumer group. And, although most large agencies and independent firms created amazing work that reached Hispanic immigrants that are largely monolingual/Spanish-speaking, no one was reaching the bilingual, high net-worth Hispanic consumer. This is where we come in: padma media & marketing reaches the bilingual Hispanic market that is not only financially high net-worth, but also has the highest education, consumes luxury products and isn’t (only) consuming Spanish-language media. In other words, our agency, our staff, IS the market we reach – because we are that market. We continue to strive to create non traditional consumer outreach initiatives because we are keenly aware of our surroundings and are able to work quickly and more efficiently due to our agency size. What do you consider to be a unique feature of your business? At most large agencies, someone of my level of experience wouldn’t be the day-to-day contact for the client. Usually, a senior person, or someone like myself, creates the plan and makes the presentation to the client, but a junior and inexperienced staffer does the work. At padma media & marketing, I am the day-to-day for all of the firms clients and the team supports the overall efforts. Secondly, we have one budget, versus varying ‘hourly rates’ typically dictated at other agencies, and we do not bill for basic out-of-pocket expenses such as phone or cell charges, faxes, copies or mailing fees. In other words, we don’t penny-pinch our clients. Rather, we create budgets that are unique to each project or client that include everything we estimate will be needed to do the work. What are your thoughts on the future of small businesses in a slowing economy and their importance to the vitality of the local community? Macy's Christina Aguilera "Inspire" launch. America’s small businesses are a force to be reckoned with, IF we stay technically advanced, are able to speak the same language as large corporations, and don’t loose sight of who helped us get to where we are: our employees and investors. Even if a small business employs a single person, we should always continue to treat that employee with fairness and dignity. Keeping one employee for years has more of an impact on the local community rather than employing many employees for a short periods of time. I am sincerely appreciative of the opportunity Idea Café has given us. We do not take for granted the honor it has been, and is, to be part of America’s growing number of small businesses that give a pulse to our great country and economy. As our country changes and diversifies to truly become a melting pot, padma media & marketing services have become more timely. 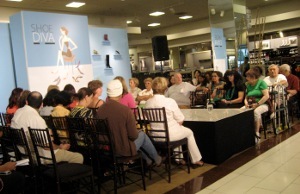 The Idea Café regulars that vote for us believe that multi-ethnic marketing communications initiatives should not only reach the monolingual consumers but also the English speakers, They also believe that the multiethnic consumer is a viable part of the American consumer markets, whose net worth creates opportunities for everyone. And lastly, the Idea Café regulars that vote for us believe that you can run an ethical PR firm that also practices ‘green’ policies and believes in giving back. Submitted by Donna Sozio (not verified) on Thu, 12/18/2008 - 00:56. Ana Lydia is there even when she doesn't *have* to be. She's always in the wings making sure everything is smooth and impeccible. What's so great about her too is that she is always so relaxed... even moments before the event. She sees marketable connects that no one else does. Congratulations Ana Lydia... you're the best! Submitted by Ana Lydia Ochoa, padma media & marketing (not verified) on Thu, 12/18/2008 - 01:02. Thank you for the opportunity Idea Cafe! Submitted by Anonymous (not verified) on Thu, 12/18/2008 - 01:05. Ana Lydia Ochoa is a pleasure to work with. I've only recently had the pleasure of partnering up with Padma for an upcoming event that I believe will be incredible. We here at Metromix Los Angeles are implementing ideas for future marketing strategies that are much different than the traditional way of getting your message across. I would venture to say that Padma Media & Marketing will soon be one of the top performers of the future! Ana Lydia is smart, aggressive in her work, and knows what it takes to make things happen. Submitted by Harold Cabezas (not verified) on Thu, 12/18/2008 - 01:30. Having known Ana Lydia now for almost two years, I have marveled at her tenacity and ease with which she navigates through multiple multicultural markets with ease. She is very open, willing to assist other professionals. She definitely is the perfect candidate for this-she has my vote!! Submitted by Norah Salazar (not verified) on Thu, 12/18/2008 - 13:41. I am a former colleague of Ana Lydia, she is an inspiration and a pleasure to work with. Having an understanding of the Hispanic multicultural market is key and she exemplifies it through her work. Submitted by Cory Honickman (not verified) on Sat, 12/20/2008 - 23:11. Being involved in all aspects of the work your company does, ensures ongoing relationships and the ultimate outcome. I am so impessed with the services Ana Lydia provides! Submitted by Melanie Sillifant (not verified) on Mon, 12/22/2008 - 02:42. I have known Ana Lydia for over twelve years and worked with her in the past. She is an honest and hard working individual who dosn't give up on what she believes in. She strives to achieve the best results possible for anything and everything she puts her name to. I strongly believe that she deserves this honor. Submitted by Victoria Murad Colleague (not verified) on Tue, 01/06/2009 - 04:26. Ana Lydia is both creative and professional, an unusual combination. She's also an innovator with demonstrated results. She is worthy of this honor. Congratulation to Ana Lydia and everyone at Padma Media and Marketing!